Fish soup is much easier and quicker than it appears. 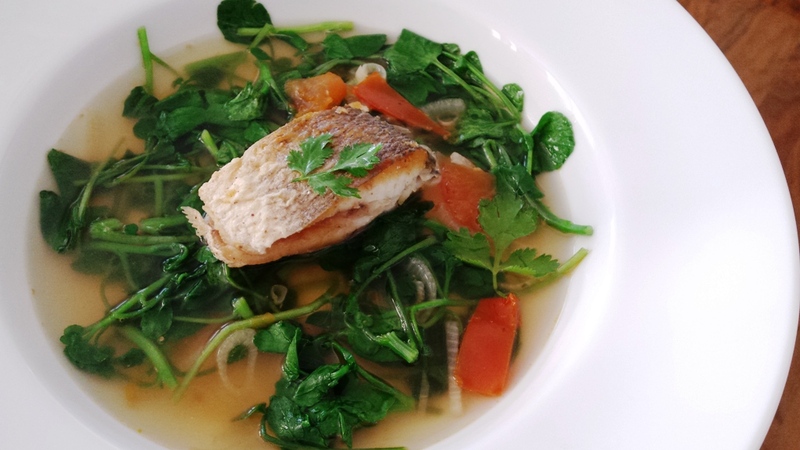 With very few simple ingredients this fish soup is a very healthy option and low in fat and an abundance of fresh taste. 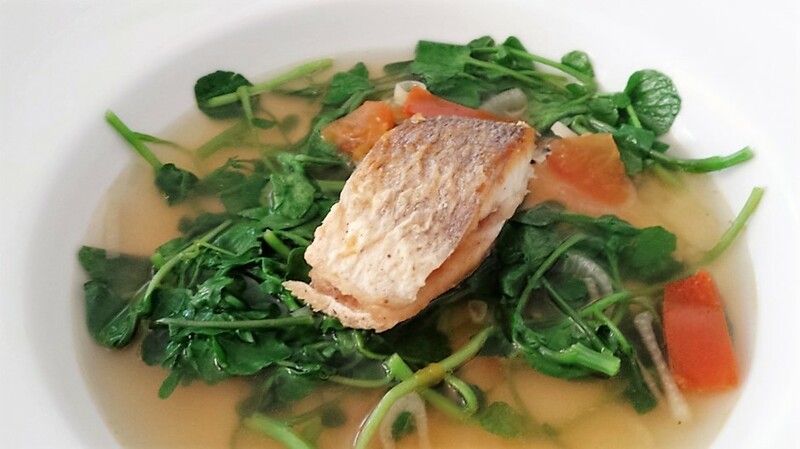 The addition of fresh watercress is very much a Mauritian style of making fish soup. Back in Mauritius watercress is usually substituted with Moringa Leaves – “Brede Mouroume” as it is in abundance across the Island and can be found in most people’s home garden. This is my first recipe where I have calculated the calories per servings and I was quite amazed and pleased to say just by adding a bag of green, which in this case a bag of watercress changes the calories amount in the dish. The green does not just add great texture, colour but above all great nutritional value to this humble and delicious dish. 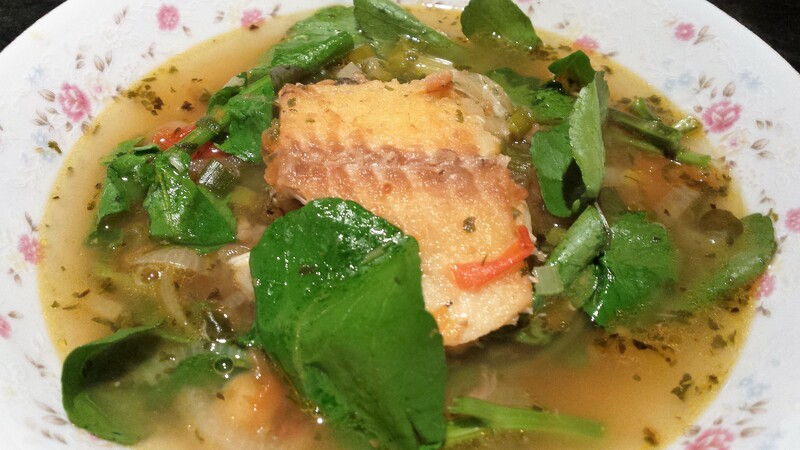 Mum always used to add some kind of greens to fish soup, now I know why, clever Nutritionist mum – mums always knows best. Start by preparing the fish, wash, pat dry and season with salt and pepper. Heat 2 Tbs oil in a non-stick pan; fry the fish 2 minutes on each side. Remove and set aside. Add another tablespoon of oil in the same pan, add the onion sweat gently until soft, now add ginger, garlic, thyme and chopped tomato. Cook on medium heat until all well incorporated and the tomatoes have softened, add fish stock or water. Cover and simmer for 10 minutes or until it starts to boil. 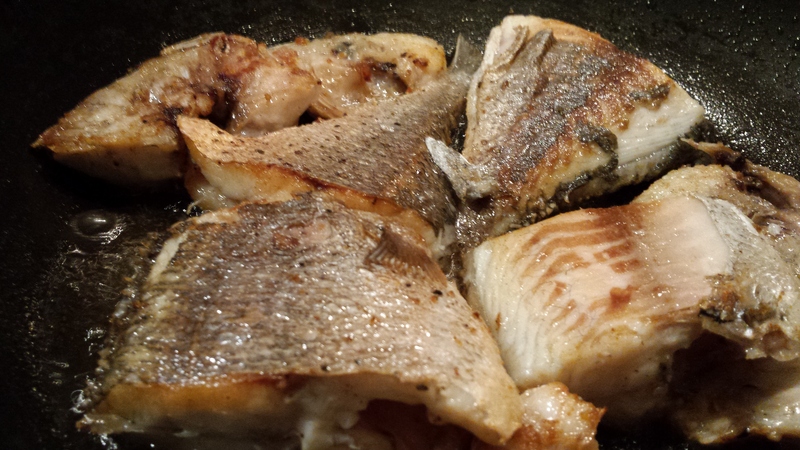 Turn heat down; add the fried fish and watercress. Taste the soup and season if necessary; sprinkle half of the chopped herbs. Mix gently cover leave to simmer for an additional 2 mins. Turn heat off. Serve drizzled with olive oil and sprinkled with the reserved chopped herbs. Brinda’s Note: You can have this soup with bread or with plain boiled rice – it’s a very light meal and full of fresh taste.